In a singing contest (and in any vocal performance), your stage performance is just as important as your vocal performance. But growing up as a self-taught singer, I never considered nor consciously knew the importance of stage presence for my overall performance, singing contest or not. Of course, I stood in one spot for a song. Of course, I only looked at the back wall when I sung. The thing is, I was singing only—not performing. So here’s to helping you so that you don’t repeat any of my mistakes! Tip #1: Become the song. As a singer, I always find that a performance where I am intentionally engaged in the entire song, from the lyrics to the music, I enjoy my time on stage much more. I like to believe that my audience would say the same. I intentionally engage with the song by taking on the role of the protagonist, or in other words, the person who is telling the story in the song. I tell her story, as the singer. I also listen to the music of the song: how does it make me feel? I try my best to send that same sentiment to my listeners through my body language, vocal tone, and facial expressions. Tip #2: Use the entire stage. It took me a while to figure this out. In the beginning, for every single song I sung, I would simply stand center stage. I never ventured off that circular perimeter of the front center stage. In due time, I realized that in order to engage and entertain me, my favorite music artists would often times use the entire stage. From the left side to the right side, they entertained all angles of the arena. So should you, if you want to give a winning performance. I’ve seen both sides of this in our community: individuals who either abuse the stage or neglect the stage. I am thinking it is because we are not yet confident on how to use the entire stage, because hardly anyone does except for 15-member dance troupes. But give yourself the permission to reach your entire audience by using the entire stage. People are listening and watching from every angle, so connect with them even more by getting closer at all angles. Like in any relationship, when you get closer and connect with others, you leave an imprint on their hearts and/or minds. You will do the same onstage. At times, you may choose a song that would be best performed only front and centered on stage. Perhaps the song is truly more powerful to stay in only one spot. I determine this by knowing and planning how I want a song to be delivered. So give yourself the permission to do the same too. Tip # 3: Create eye contact with actual eyes. In the beginning, I was given the tip to look at the back wall when I performed, because I was so nervous. It was better than looking down at the ground, right? What I didn’t realize was once you’re past that stage fright period of your music career, start connecting with your audience members by actually looking at them. I know this sounds ridiculous and like basic common sense. However, it took me a long time. I did not discover the true meaning of connecting with others onstage until this past July 2013. While performing "Lub Ntsej Muag Zoo Nkauj", I unconsciously decided to look at the front row of the beautiful Hmong women dancing before me. They saw me. I saw them. And it changed me for the better. I serenaded them through my eyes. 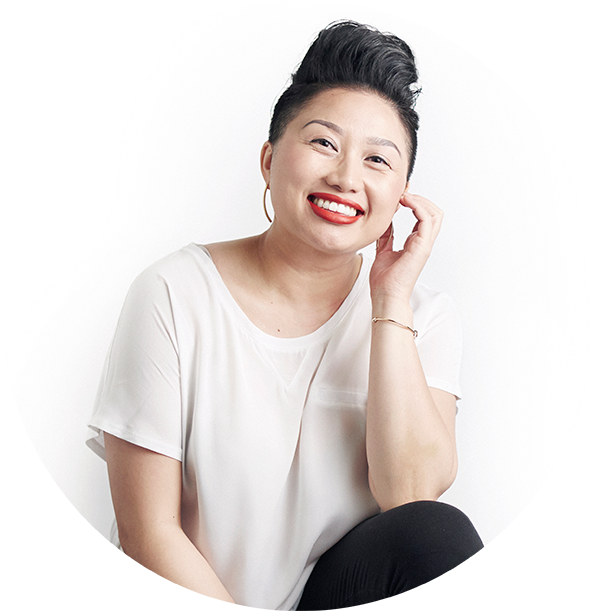 It taught me that I could connect even more with my audience and it was LIBERATING. So liberating that I want to do it again. Honestly. Imagine you genuinely connecting with your audience (and don’t forget the judges) just by looking at them. Imagine what they would take away from your performance. Imagine what you would take away as a performer, as a human being. I promise, it will be incredible. An introduction is great because you and the sound engineer in the back can test your mic before you actually have to sing. However, in your introduction, it is not a requirement to thank the entire Hmong community by specific name or category (ie. “Nyob zoo ib tsoom niam txiv, kwv tij, neej tsa, phooj ywg, tsoom fwv, cov hlob, cov yau, cov nom, cov tswv, thiab cov hmov tshua sawv daws txhua leej txhua tus…etc.”). This can be intimidating for some young folks as it is not typical to say all this in everyday conversations. Simply keep it short and be yourself. Setting the tone right away with a relaxed introduction will greatly ease the audience and help your performance as well. Why start out nervous with an iffy introduction when you can just be yourself? Judge’s Tip: Be respectful of your song. If it is an original song written by you, state that. If it is not original, state the original artist’s name. Also, towards the end of your song, do not thank the audience or leave the stage while your song is still playing. Out of respect for your song, wait until the song ends, then close off your performance with gratitude. Bottom line: Capture your audience (and the judges) by using the full stage, making actual direct eye contact, and becoming the song. 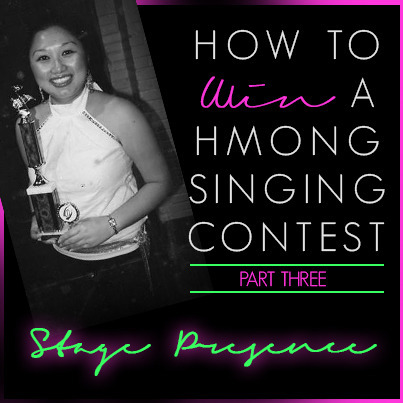 Hope you enjoyed Part Three of my “How to Win a Hmong Singing Contest” blog series. Catch Part One and Part Two, here. And as always, feel free to leave me a comment/question and make sure to look out next week for the last part of this series!